Special while supplies last! FREE TP-cj40L Jacket (40mmx53mm long) Water Jacket with TP Motor Purchase, $20 Value! Special while supplies last!!! These are higher output than the tp-4070, they are rated to run upto 75,000rpm for 10 seconds or less. These are designed for rc boats, trucks or cars that are running high speed straight line competition. NOT for long run times. These are hand wound for high efficiency of up to 90%. Comes with high quality bearings and neodymium magnets for high power. Large vented front and rear endbells for additional heat dissipation. We offer this in 2 versions. See below for options. -2200Kv Version, 34.0v maximum for 10 seconds or less. -3200Kv version, 23.5v maximum for 10 seconds or less. 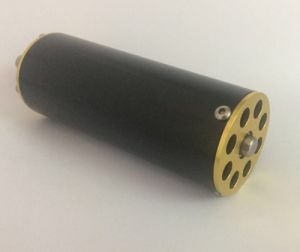 Motor Shaft: 5mm or 8mm with flat spot. Mounting Holes 25mm apart for use with most 540 mounts. Bullet connectors. We suggest the OSE 8mm Bullets. NOTE: This is a competition motor. Due to the high strains for pushing equipment when racing, there is no warranty on this item. OSE Suggests 20,000-35,000 total rpm for boats. We suggest most Fast Electric Boaters should run in the 25,000RPM range for Sport Boating or 30,000RPM Range for racing. These are only guidelines, we suggest if you do not have the knowledge to pick the correct motor, please consult us first or other members of the rc fast electric boating community. Either at a local club or on our OSE Forums. FREE Water Jacket! Pick Size? TP 4070 Hydro Mount with esc plate.